Jerry Seinfeld is an American stand-up comedian, actor, producer, and writer. Seinfeld is best known for playing himself in the sitcom ‘Seinfeld’, which was written by Larry David and himself. He’s had an incredibly successful career as a stand up comedian; and in 2019, Jerry Seinfeld’s net worth is estimated to be $950 million. Jerry Seinfeld was born on the 29th April, 1954, in Brooklyn, New York City. His mother was of Syrian descent, and his father of Hungarian descent, and they were both raised in Jewish households. Seinfeld grew up in Massapequa, New York, and attended Massapequa High School on Long Island. He spent time in Israel when he was 16, volunteering in Kibbutz Sa’ar. Later on, Seinfeld attended State University of New York at Oswego, transferring after his second year to Queens College, City University of New York. He graduated with a degree in communications and theater. Whilst Seinfeld was at college, he was involved in various productions, and this was where his inspiration to become a stand-up comedian came from. He tried out at various open mic nights around New York City, and got a role in the sitcom Benson in 1980; which he was later fired from. In 1981, Seinfeld appeared on The Tonight Show, and people quickly began to become aware of who he was. In 1988, he created The Seinfeld Chronicles with Larry David, which was hugely successful, and is where most people know Seinfeld from. Since then, Jerry has appeared in a lot of different productions, and had an incredibly successful career in stand-up comedy. His career has been so successful, that Jerry Seinfeld’s net worth is estimated to be $950 million, making him the richest comedian in the world. View our larger collection of the best Jerry Seinfeld quotes! Jerry Seinfeld is the richest comedian in the world, being worth almost a billion dollars as things currently stand. In 2019, Jerry Seinfeld’s net worth is estimated to be $950 million. 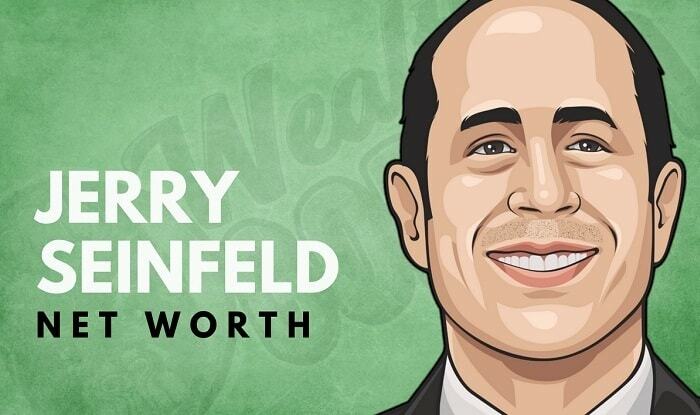 What do you think about Jerry Seinfeld’s net worth? Leave a comment below.